Born on the 12th of December 1966, in Zawyat Abo Musallam, Giza. His father was a peasant who exerted all his efforts to educate his children. Mahmoud, who was up to his father’s expectations. He was brilliant. He joined the faculty of Economics and Political Science. He received his BA, did a premaster course, then he studied law, history and took a diploma in political science from the Arab Studies Institute of the Arab League in 1998. The avert student was also an ambitious young man and a hardworker, as he commenced his career as an editor and producer of political programs in Sawt al Arab radio station for ten years, during which he also worked as a researcher in the Al-Ahram Center for Political and Strategic Studies (ACPSS), then in the Arab Unity center, Cairo office, then the Civilization Studies center, beside working as an editor in Qatari newspaper “Al Sharq” in their Cairo office. Mahmoud began his TV career in 1997, as he worked in Nile News as a correspondent, then he was promoted to be the chief correspondent. Afterward, he worked in Al Alam Iranian TV in 2004, then he became the correspondent of the Bahraini TV next year, then a correspondent to the Sudanese TV in 2006. A director of the Iraqi Rafedin TV office and finally a director of the Sudanese TV office in Cairo. 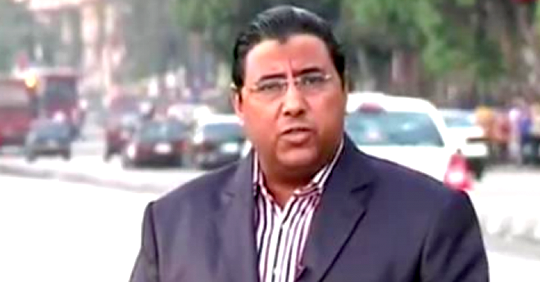 In late 2010, Mahmoud started working with Al Jazeera. He worked as a producer, then a correspondent in Cairo. Mahmoud covered the 25th January 2011 revolution for al Jazeera, and he continued working there until the Egyptian authorities closed their office in Cairo in 2013, he, therefore, was transferred to work in the channel headquarters in Doha as a producer in the correspondence department. Nevertheless, Hussein’s hardworking and success turned to be against him. For political disputes between two Arab countries, Mahmoud was to pay a high price after relations deteriorated between Egypt and Qatar. The Egyptian authorities do not differentiate between the Qatari government and Egyptians who work in Qatar, treating them as if they are spies. Publishing false news, statements, and rumors concerning the interior status of Egypt. Fabricating false scenes and media reports. Exceeding the constitutional pre-trial detention period, Mahmoud Hussein is still imprisoned for more than two years, suffering wait loses and health deterioration.